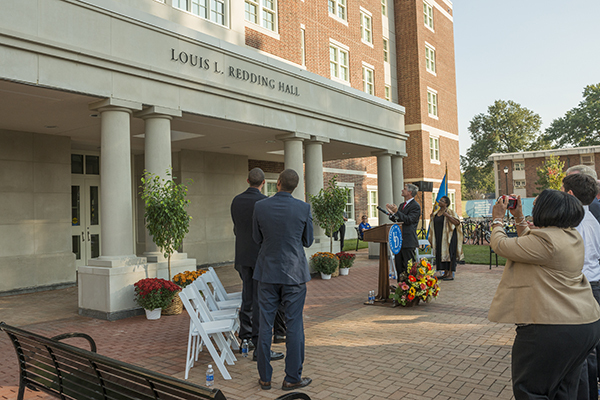 The name of Louis L. Redding Hall is unveiled as the building is officially dedicated in an Oct. 4 ceremony. 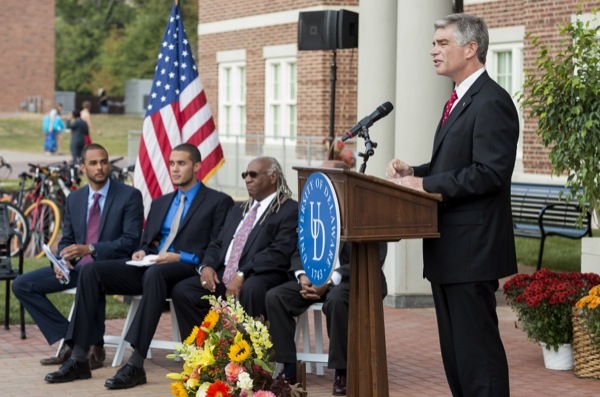 UD President Patrick Harker: "This is an incredibly special day for us -- a day of remembrance and celebration and, frankly, a day long overdue." 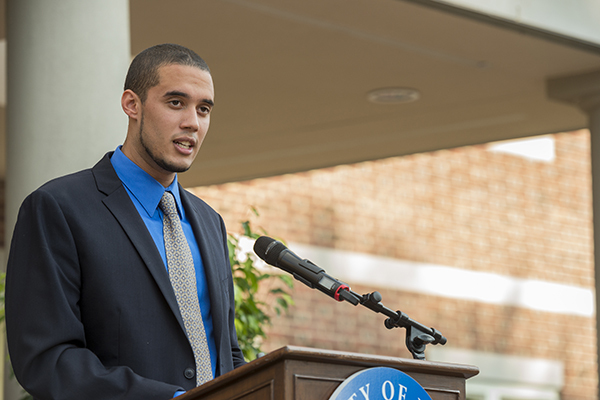 James Jones, director of UD's Center for the Study of Diversity: "We are inspired by Mr. Redding's courage, his dedication, vision and humanity." Leland Ware, the Louis L. Redding Chair for the Study of Law and Public Policy: "A group of individuals in this community raised the money to fund an endowed chair, a group that included students of middle schools, prisoners in jail -- a wide range of people who rose up to complete the funding of this chair. I'm very proud to be the first Louis Redding Professor." Louis Redding's daughter, the Rev. J.B. Redding, delivers the invocation. Louis Redding's grandson Lucas Lallinger: "My grandfather has always been my hero and inspiration." Louis Redding's grandson Stefan Lallinger: "We must reflect on how we can bring to bear his vision of equality of opportunity for all Americans." Members of Louis Redding's famly at the dedication: from left, grandson Stefan Lallinger, granddaughter India Nixon, daughter J.B. Redding, granddaughter Monika Lallinger, daughter Ann Holmes Redding, grandson Lucas Lallinger and daughter Rupa Redding Lallinger. 4:10 p.m., Oct. 7, 2013--By winning a 1950 decision in Delaware Chancery Court, Wilmington attorney Louis Lorenzo Redding opened up the University of Delaware to African American students. 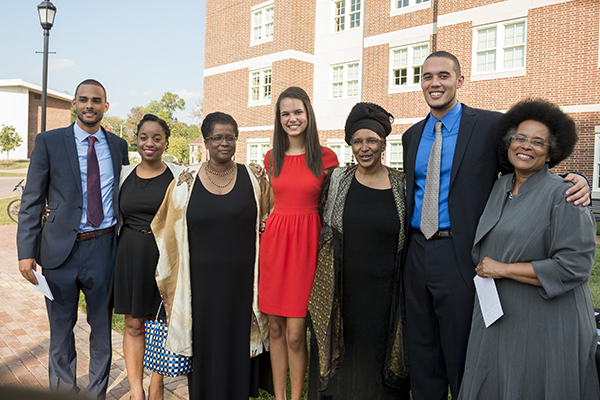 On Friday, Oct. 4, members of the Redding family and friends joined with members of the University community to honor the pioneering civil rights lawyer by officially dedicating the Louis L. Redding Residence Hall on UD’s East Campus. 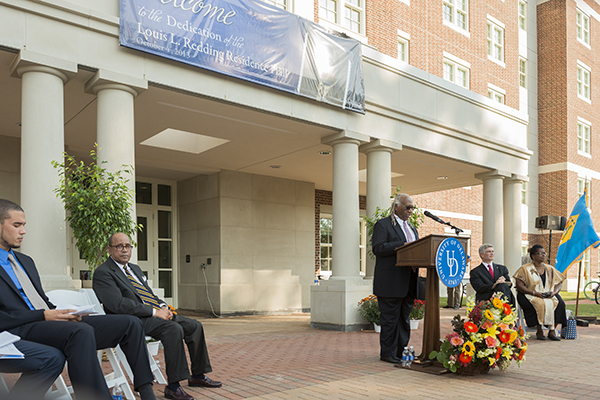 UD President Patrick Harker welcomed the guests at the ceremony, which also marked the opening of the adjacent Eliphalet Gilbert Hall, named after the University’s first president. 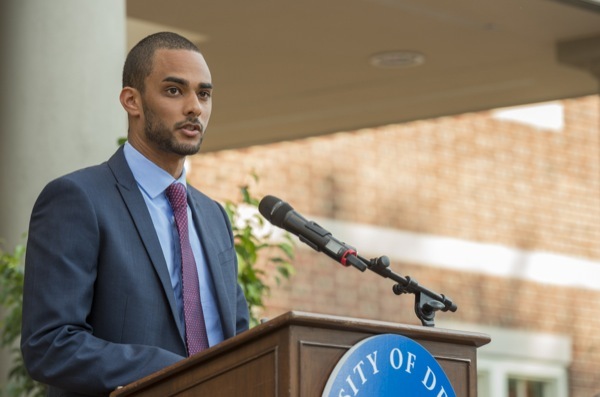 Harker noted that by honoring Redding and those who pursue justice, demand equality and work tirelessly to protect the civil rights and human dignity of all, UD rededicates itself to its core principles of diversity, equity and inclusion. Among the family members attending the dedication were Redding’s three daughters, the Rev. Ann Holmes Redding, president and founder of Abrahamic Reunion West, a nonprofit dedicated to peacemaking; Rupa Redding-Lallinger, professor of pediatrics and internal medicine at the University of North Carolina-Chapel Hill; and the Rev. J.B. Redding, founder and CEO of Caring Hands, who gave the invocation. Leland Ware, the Louis L. Redding Chair for the Study of Law and Public Policy at UD, noted that the first recognition of the advocate of social justice began shortly after Redding’s death in 1998. 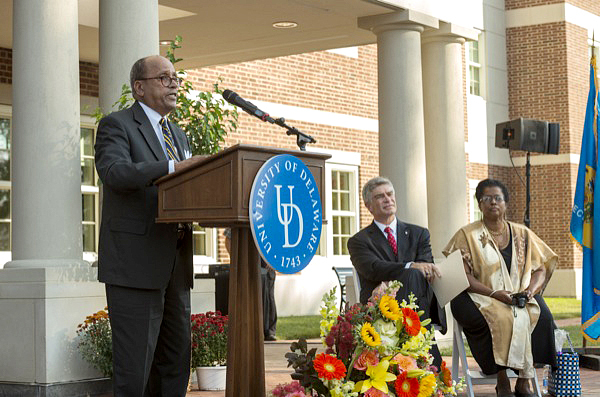 James Jones, director of UD’s Center for the Study of Diversity and professor of psychology, lauded Redding as an American hero and a Delaware treasure. Jones noted the Redding’s commitment to justice saw him through his undergraduate years at Brown University, where he graduated with honors in 1923, and through graduate education, where he was the only African American in his 1928 graduating class at Harvard Law School. He also cited Redding’s endurance as the only African American lawyer in Delaware for 26 years. Jones also noted that Redding’s successful efforts in fighting segregation in Delaware led to his involvement in an even larger mission, which ultimately bore fruit in the historic Brown v. Board of Education decision in 1954. 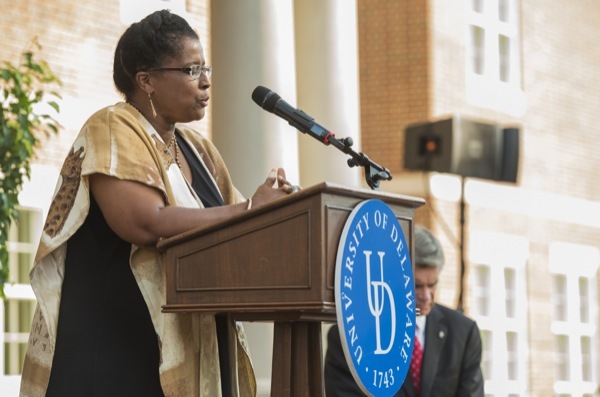 Redding’s legacy, Jones said, is reflected in the growth from single digit numbers of African Americans on campus in the early 1950s to the 2,459 students of color attending UD in the fall of 2013. A continuation of Louis Redding’s efforts on behalf of social justice also was evidence in remarks by his grandsons, Lucas and Stefan Lallinger. A student at Yale Law School and staff member of the Yale Journal of International Law, Lucas Lallinger reflected on what his grandfather’s legacy means to members of a newer generation. As a summer intern in the office of then-U.S. Sen. Joseph R. Biden Jr., Lucas Lallinger said he had the opportunity to learn more about the profound influence his grandfather had on those who knew and worked with him, including Vice President Biden. Stefan Lallinger, principal of the Langston Hughes Academy Middle School in New Orleans, noted that, like himself, his grandfather was an educator and an administrator before beginning his famed legal career. After the ceremony, a reception was held inside the newly dedicated Louis L. Redding Residence Hall.